On January 24, BuzzFeed reported  that Cecile Richards plans to step down as president of Planned Parenthood. Richards confirmed  the news on January 26, saying she is departing the organization some time this year. Immediately, anti-abortion and right-wing media and groups took the opportunity to smear Richards and Planned Parenthood in a number of outlandish ways. The Federalist inaccurately claimed  that Richards was leaving “amid an ongoing federal investigation.” The story pointed as evidence to the Department of Justice’s procedural request  to the Senate judiciary committee in December 2017 for documents related to the anti-abortion group Center for Medical Progress’ (CMP) discredited videos , which purport to show Planned Parenthood engaged in illicit practices. Anti-abortion outlet LifeSiteNews published  a piece that quoted CMP’s founder David Daleiden who alleged that Richards was leaving because “the secret is out that Planned Parenthood is a taxpayer-sponsored crime syndicate of industrial-scale child killing." On One America News’ Tipping Point with Liz Wheeler, host Liz Wheeler said  that although some might refer to her as "a conspiracy theorist,” her previous segment “about the legacy of Cecile Richards” was “666 words exactly.” She made  the same point on Twitter. 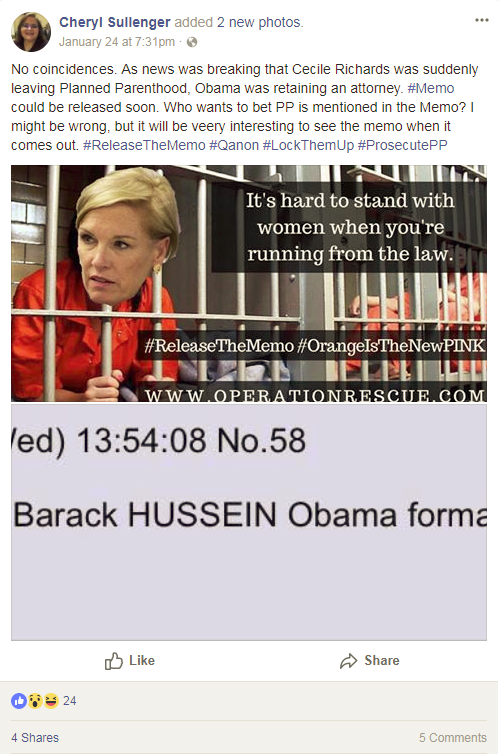 Anti-abortion group  Operation Rescue’s Senior Vice President Cheryl Sullenger -- who served  two years in prison for conspiring to bomb an abortion clinic -- posted on social media a series  of photoshopped  images  of Richards  wearing an orange jumpsuit in a prison cell and used a variety of hashtags, such as #ReleaseTheMemo and #Qanon. Sullenger’s use of the hashtags was likely an attempt to connect Richards’ departure to the right-wing campaign  against special counsel Robert Mueller and the conspiracy theory thread  on 8chan message board, respectively. 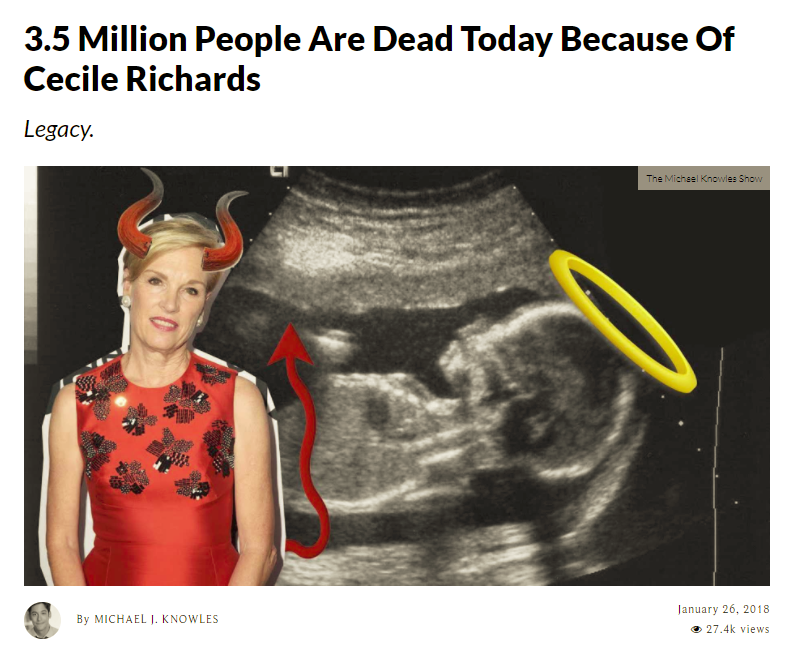 The Daily Wire called  Richards “Planned Parenthood’s chief maniacal ghoul” and stated that “we can only hope Cecile Richards returns swiftly to the obscurity of whichever cavern of Hell spawned her.” The image accompanying the article -- titled “3.5 Million People Are Dead Today Because Of Cecile Richards” -- depicted Richards with devil horns and tail, photoshopped on an ultrasound image of a fetus with a halo.